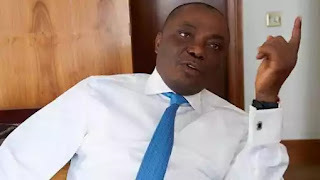 The police in Delta State have arrested three police officers and a driver attached to the Senator representing Delta North, Peter Nwobuoshi, in connection with the alleged burgle of his Asaba residence by unknown gunmen. The hoodlums, it was gathered, invaded the senator’s house in the early hours of Monday and allegedly carted away unspecified amount of dollar and naira notes running into millions. It was also gathered that the gunmen stole laptops, expensive clothes, jewelries and other valuables worth millions of naira. According to sources, most of the stolen items belonged to the wife of the senator. The sources disclosed that the operation lasted for about 30 minutes, while the police and other security personnel on guard at the senator’s house along Olanrewaju close, near Interbua, Asaba, were no where to be found. When contacted, the police spokesman, DSP Andrew Aniamaka, who confirmed the report, said the police are investigating the matter to ascertain how the gunmen gained access into the house unchallenged. Meanwhile, the Okpala-Uku of Ogbe-Ogume community in Ndokwa West Local Government Area of Delta State, Ossai Enebeli, yesterday raised the alarm following alleged threats to his life by some irate youths in the community. In a letter addressed to the governor, Dr. Ifeanyi Okowa and the state police command, the monarch alleged that some irate youths had twice attempted to depose him for reportedly failing to sign a document relating to zoning of councillorship slots round the various families and quarters of the community. The petitioner further alleged that the youths numbering over 150 stormed his palace last Monday during one of the community meetings and demanded that he signed a document already written to zoning of councillorship slots, stating that upon his refusal, the irate youths attempted to beat him up but succeeded at hauling stones at him. The monarch also alleged that the youths in the process attempted to steal the community’s deity and other leadership symbols as part of their process of dethroning him, and called on the state government and the law enforcement agents to come to his aid.